Criccieth has two excellent Blue Flag beaches. One to the West of the castle is pebbly and is known as Marine Beach, it has views straight out to sea and is safe for bathing. Head West towards Pwllheli and you can walk for miles either along the beach or along the path above. The beach East of the castle is probably known as the main beach and is a mixture of pebbles and sand. It has glorious views out to sea and to the mountains stretching southwards along the Welsh coast. 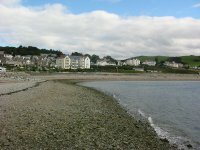 Walk to the East, maybe dallying for a while to search the rock pools for local wildlife, to visit Black Rock which really is black and marks the boundary between Criccieth beach and Black Rock sands at Morfa Bychan. 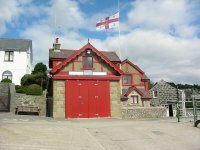 You can often see the RNLI launching their lifeboat for test exercises from the town end of this beach and sometimes sadly for real emergencies, visit the RNLI station and see for yourself the magnificent work that these volounteers do or visit the gift shop for that meaningful souvenir. 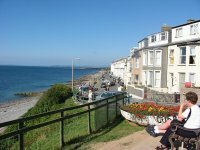 Criccieth is washed by the Gulf Stream and therefore has a temperate climate, both beaches are visited regularly by porpoises and many locals swim in the safe and mild waters every day of the year. Other beaches nearby include Black Rock Sands at Morfa Bychan with its vast expanse of clean sand, Harlech with miles and miles of sandy beach backed by sand dunes and Pwllheli with its sandy beach.